Swimming Underwater can be a lot of fun. But did you know that it can have dire or even life-threatening consequences? Read more below. Swimming Underwater can have dire consequences. Let’s be honest, as a child, everyone has at least once played the game with his friends about who could hold his breath underwater for the longest time or who could swim underwater the farthest. While these activities may look like harmless children’s games, they are in fact dangerous because they can at first lead to shallow water blackout and subsequently to drowning. 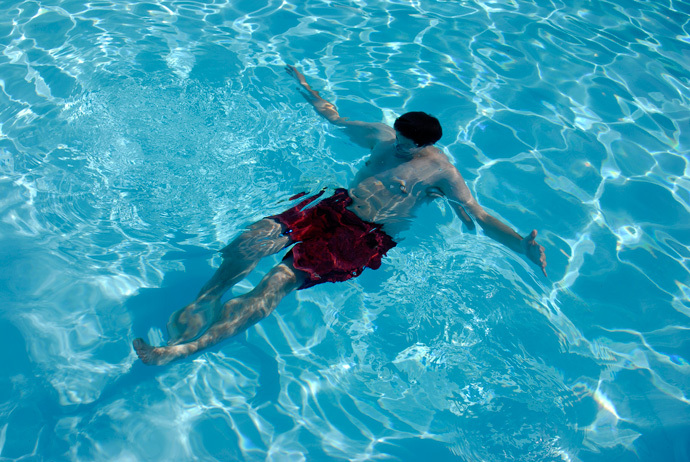 Shallow Water Blackout happens when a swimmer or diver faints in shallow water, which is less than 16 feet (5 meters) deep. Typically the victim hyperventilates before diving or swimming underwater, then dives or swims while holding her breath. This leads to fainting underwater due to low oxygen levels in the bloodstream. Why does this happen? In fact, the urge to breathe is driven by the level of CO2 (carbon dioxide) in the bloodstream. However, if you hyperventilate, the CO2 is flushed from the bloodstream to a low level. The urge to breathe will then set in much later than if you didn’t hyperventilate beforehand. So if you do hyperventilate before you dive or swim underwater, what can happen is that the oxygen stored in the body is consumed before the level of CO2 in the bloodstream rises enough to trigger the urge to breathe. You then blackout without any warning signs. What makes this problem worse is that from the water surface, it often looks like there isn’t any problem. The victim doesn’t make any warning signs or may even still be moving unconsciously. As we have seen, diving or swimming underwater while holding your breath is dangerous, especially if you do hyperventilate before. This explains why many public swimming pools forbid these activities. Sadly, the general population is not yet well aware of this danger and still needs to be educated. It is best to avoid these activities at all. However, there are cases where you need to dive or swim underwater while holding your breath, for example, to pass specific certifications. In that case, you should always practice under the supervision of a lifeguard or friend that knows CPR (Cardiopulmonary resuscitation) and avoid hyperventilation before you dive or swim underwater. Shallow Water Blackout Prevention site. Apparently, I have been endangering myself for 20 years. This is my self-test for lungs that I typically do. During my regular swimming activities, I most often stop after my first 60 lengths of the pool (YMCA-75 foot pool), rest, and do a series of deep breathing steps to expand my lungs. After one deep breath, I push off and swim the 75 feet from the deep end to the shallow end in about 36-38 seconds in one breath. I have never been forced to come up early, but I have always left myself open to doing just that. Now, I am told, by the YMCA after 15-20 years of doing this, that I must stop doing it. I do not disagree with the policy except that I have logged many years of doing it with no problems. I am a bit unhappy that I must stop something that I regularly do. Ummm. Is taking a deep breath hyperventilating? The above article is the first formal writing I have read on this subject. I am not surprised to read it, as the YMCA has told me about how dangerous it is. Not sure yet if they are protecting me or protecting the YMCA. I am a 76 year old senior and I do not consider myself in a senile state just yet. (1) have a buddy and (2) do not hyperventilate. (1) the buddy must know what you want to do and follow you throughout the whole dive. An informed lifeguard is not enough! He might be distracted by a beautiful girl or something else and you are dead. (2) hyperventilation is any breathing that is more than you breathe now in front of your computer (i.e. very shallow and slow breathing). Already thinking of controlling your breath normally leads to speed up your breath and will lead to a lower level of CO2 in the blood. It is extremely difficult not to hyperventilate before a long dive. Also deep and slow breathing like in yoga is hyperventilation. One last deep breath is not hyperventilation, as you do not lose CO2. In the discipline without fins a typical high-level freediver with normal breathing (hyperventilation) before the dive would feel fine to ca. 80 m and then suddenly blackout. With the right technique of almost not breathing and starting with a high level of CO2 he feels already bad at 40m but can go on to more than 200m without blacking out. I want to swim underwater and touch the bottom of the pool. But I find it difficult to go underwater. The head always bob’s up. I do kind of a flip so that my head is down and my legs are up and then do breaststroke movements to swim downward. I want to increase my endurance and speed in freestyle. Could you give me some exercises for this? I’ve just learned this in my swimming lesson (adult improvers) and did my first handstand and somersault!!! The teacher said you need to expel ALL the air (blow out) as quickly as possible as you go down, and tuck your chin in. After 43 years it worked like a charm!!! Drill videos on the website by the way, just what my teacher says, but good to see them. How deep is the bottom? If it is quite deep, at least 3, 4 meters, take a deep breath while treading water at the surface. Then, perform an arm over arm surface dive and exhale while making your way to the bottom of the pool. Air in your lungs makes you lighter and prone to floating back up, so we need to release some of this air to make it to the bottom, be careful you have enough air to get yourself to the bottom! Any sort of free diving takes knowledge of your own body and its limits. Experiment a bit but keep safe. The air in your lungs increases your buoyancy, try exhaling through your nostrils while in the pool. That should help. I have been a regular swimmer for the last couple of years, and swim in a 16 feet deep pool. 3 months back I had a mild paralysis attack, and was admitted to a hospital for treatment. While in the pool I was trying to stand on the floor 16 feet below. I was comfortable for 30 seconds, but then I was trying to hold my breath for a longer time with the intention to reach for 60 seconds. Was the paralysis attack due to this act?? It would be best to discuss this with your physician.